Since the early 80s, innovators at Biosearch have refined the chemistry of custom oligonucleotide synthesis to accelerate the discovery and application of genomic information. Our unmatched selection of oligo modifications is complemented by our demonstrated expertise in the design and manufacture of fluorogenic probes and primers. The ability to specifically detect and quantify the amount of a particular nucleic acid sequence in a sample has revolutionized molecular biology and science as a whole. We can now elucidate many genetic elements, such as identify genomic copy number variations, the presence of pathogens, or assess the expression of a gene in large populations. However, all qPCR applications are limited by our ability to identify these changes. We are still reliant on the specificity of the underlying detection technologies. Intercalating dyes have been around for decades but may report signal from non-specific amplification. Linear hydrolysis probes are also a well-established reporting mechanism but are often unable to be designed against tough sequences. These challenges are overcome by the recent development of BHQnova™ probes from LGC Biosearch Technologies that can provide improved signal-to-noise ratios in the detection of your target, especially if longer probe lengths are required. 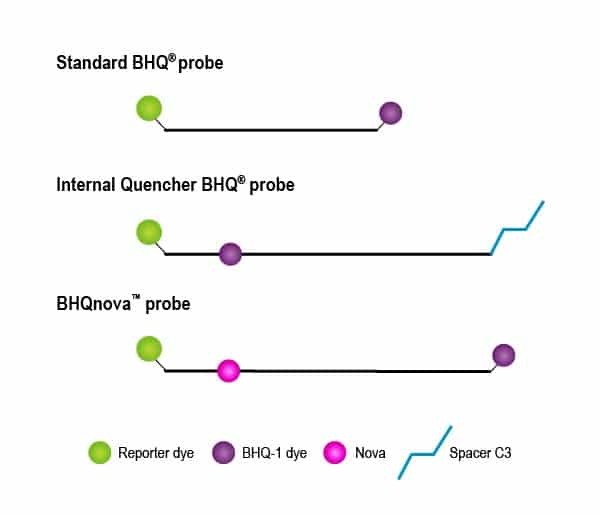 BHQnova probes build upon the existing BHQ® (Black Hole Quencher) probe technology with the incorporation of a second “Nova” quencher modification internal to the probe sequence. The quenchers in the BHQ systems are unique as they use “dark” forms of quencher molecules that are non-fluorescent. 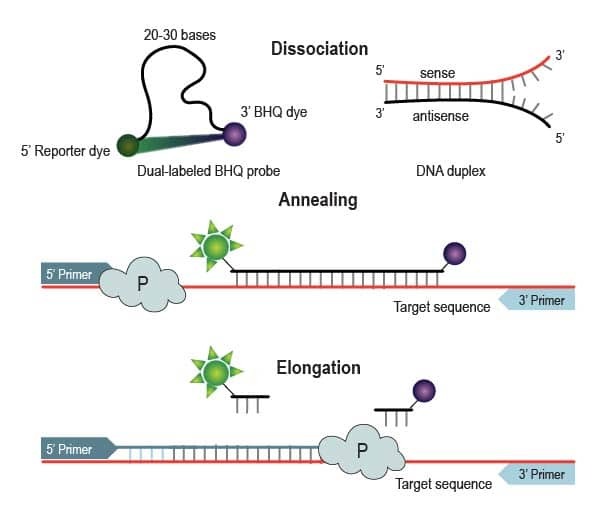 The BHQ technology more efficiently quenches the fluorescence signal than traditional FRET quenchers pairing, such as FAM-TAMRA labelled probes. When not bound to the amplicon, the quencher modification on the probe will absorb the light energy emitted by the fluorescent reporter and distribute that energy in a non-fluorescent manner. The line of Black Hole Quencher modifications has absorbance spectra across a broad range of wavelengths (and gives you more flexibility for which fluorophores you can use on your probes). How does the quenching system work? Figure 1 – Mechanism of action of hydrolysis based probes such as BHQ probes. From: Application Note: Improved Function with Double Quenched BHQ probes for qPCR, LGC Biosearch. Heat during the denaturation step separates the DNA strands. In an unhybridized state, the probe will assume a random coil formation where the fluorophore and quencher are in close proximity to one another. This arrangement of quencher and fluorophore quenches much of the fluorescent signal. Through lowering the temperature, the primers anneal to the target template. The polymerase will begin to extend the new strand of DNA. As the temperature continues to lower, the probe will then also anneal to the target sequence. This hybridized state will create a more rigid, linear conformation separating the fluorescent reporter from the quencher. Finally, during elongation of the new strand of DNA, the polymerase will encounter the probe in its path. Using the exonuclease activity of the enzyme, the polymerase will cleave the obstructing probe and permanently separate the fluorophore and quencher. 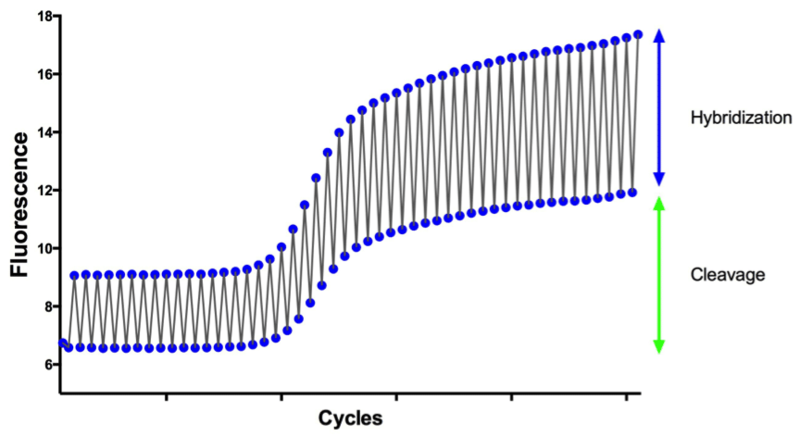 This cleavage event causes an increase in fluorescence proportional to the amount of amplicon created, which the qPCR machine detects as an amplification curve. 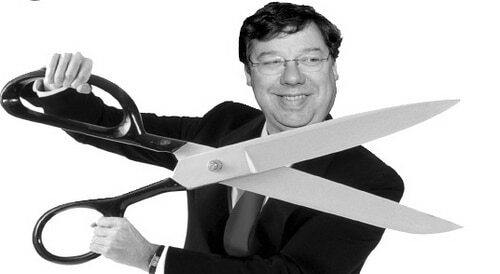 Why do I care about quenching? 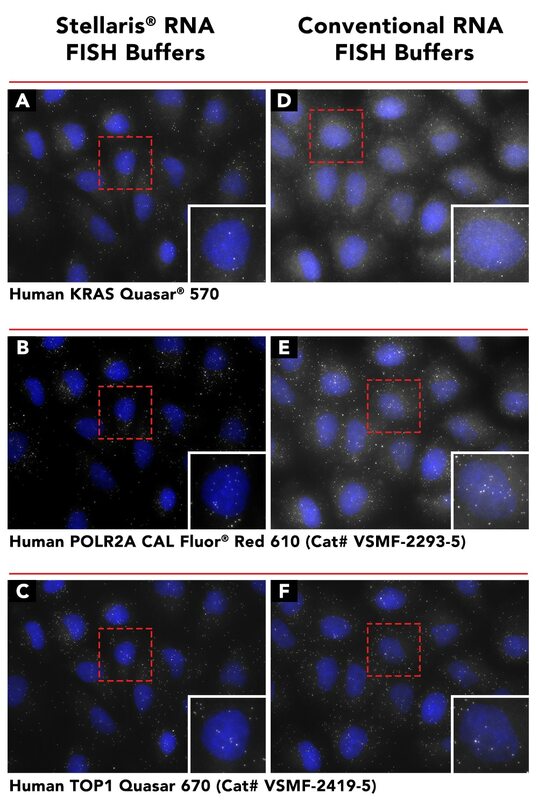 This system ensures that fluorescence signal is only achieved when the targeted transcript is amplified by the polymerase. However, technical considerations typically limit the length of the probe to less than 25 bases. The longer the sequence of probe, the longer the intervening distance between the quencher and the reporter dye. Subsequently, the probe becomes less efficiently quenched. The result of inefficient quenching is higher background signal in the assay. The increased background might impact the signal-to-noise ratio (S:N)—defined as the maximum signal detection divided by the background (basal) signal. How do the BHQnova probes overcome the probe length restriction? This length restriction can become an issue in assay design, as probes still need to conform to melt temperature (Tm) parameters to ensure they will hybridize to the template (see step three, outlined above). This is particularly difficult when sequences are AT-rich, which require longer probe sequences to satisfy standard Tm parameters. This problem is resolved with the new BHQnova probe format in which an additional “Nova” quencher is placed between bases 9 and 10 at the 5’ end of the probe (Figure 2). Figure 2 – Structure of BHQ probes, including the double quenched, BHQnova probes. Reporter denotes the fluorescence probes whereas the BHQ-1 and Nova denotes quenchers. From: Application Note: Improved qPCR Assays for Copy Number Variation using Double-Quenched BHQ Probes, LGC Biosearch. The positioning of the second internal quencher modification in the probe relaxes these design requirements enabling the use of much longer probe sequences without sacrificing performance. This leads to consistent probe performance across a wide range of probe sizes – up to 35 bp (see Figure 3)! BHQnova probes show consistently lower background signal in probes designs which are 25 bases or longer. For probes that are shorter than 25 bases, the standard BHQ probe are still the preferred option. 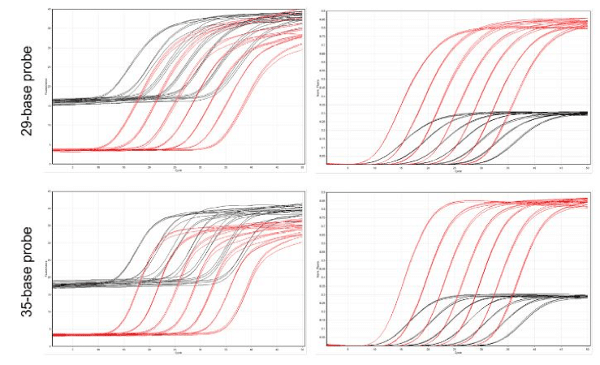 Figure 3 – Comparison of amplification traces from a standard end-labeled probe (Black) and BHQnova (Red) probe of 29 bases in length.The raw fluorescence plots (right) show a large reduction background fluorescence in the baseline observed across a serial dilution of template. This results in a dramatically improved S:N ratio for the assay (right). From: Application Note: Improved Function with Double Quenched BHQ probes for qPCR, LGC Biosearch. What can I use BHQnova probes for? You can still use the standard BHQ probes available (the Dual-Labeled BHQ Probes) for situations where you don’t need your probe to be longer than 25 bp. However, the new BHQnova probes can help you out in sticky qPCR design situations, especially ones that require longer probe lengths due to sequence restrictions (such as AT-rich sequences). They are able to deliver improved assay characteristics in Copy Number Variation (CNV) studies, gene expression studies, or other applications which demand high sensitivity even with troublesome targets. Whether you have a difficult design target or just want really clean data—reach for the BHQnova probes and Quench your heart out! RealTimeDesign Software: A free program that helps design oligo sequences for qRT-PCR and SNP genotyping assays utilizing BHQ probes. Spectral Overlay Tool: A free tool that helps find the best dye and quencher combinations for multiplexed reactions to avoid overlap for your particular qRT-PCR machine. Oligo Toolbox: a series of online calculators to assist with quick determination of oligo dilution and resuspension, reaction estimation, and concentration determination. Header image from NASA Goddard Space Flight Center.